Weak magnetic and electromagnetic fields can influence physiological processes in animals, plants and microorganisms, but the underlying way of perception is poorly understood. The ion cyclotron resonance is one of the discussed mechanisms, predicting biological effects for definite frequencies and intensities of electromagnetic fields possibly by affecting the physiological availability of small ions. Above all an influence on Calcium, which is crucial for many life processes, is in the focus of interest. We show that in Arabidopsis thaliana, changes in Ca2+-concentrations can be induced by combinations of magnetic and electromagnetic fields that match Ca2+-ion cyclotron resonance conditions. 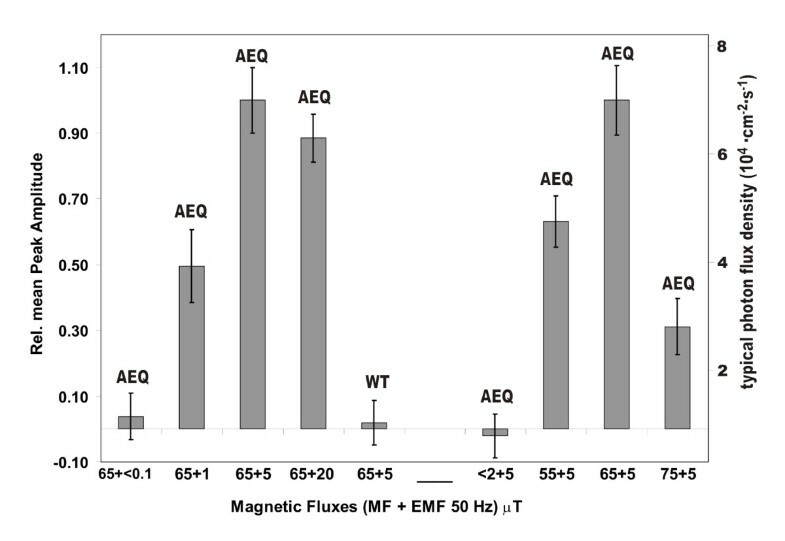 An aequorin expressing Arabidopsis thaliana mutant (Col0-1 Aeq Cy+) was subjected to a magnetic field around 65 microtesla (0.65 Gauss) and an electromagnetic field with the corresponding Ca2+ cyclotron frequency of 50 Hz. The resulting changes in free Ca2+ were monitored by aequorin bioluminescence, using a high sensitive photomultiplier unit. The experiments were referenced by the additional use of wild type plants. Transient increases of cytosolic Ca2+ were observed both after switching the electromagnetic field on and off, with the latter effect decreasing with increasing duration of the electromagnetic impact. Compared with this the uninfluenced long-term loss of bioluminescence activity without any exogenic impact was negligible. The magnetic field effect rapidly decreased if ion cyclotron resonance conditions were mismatched by varying the magnetic fieldstrength, also a dependence on the amplitude of the electromagnetic component was seen. Considering the various functions of Ca2+ as a second messenger in plants, this mechanism may be relevant for perception of these combined fields. The applicability of recently hypothesized mechanisms for the ion cyclotron resonance effect in biological systems is discussed considering it's operating at magnetic field strengths weak enough, to occur occasionally in our all day environment. Effects of weak static magnetic (MF) and electromagnetic fields (EMF) on plants were investigated since more then three decades, even though the number of studies is small compared to those performed on animals and humans . Under the aspects of ecology and environmental sciences two influences are here in the focus of interest: Firstly the ubiquitous geomagnetic field with its location-, direction- and time-dependent variations in the range from 30–70 μT, and low frequency EMF natural sources given by electromagnetic processes in the atmosphere [2, 3] and secondly, man made sources like electric power lines and wireless communication. Commonly 3 types of magnetoreception are discussed in biology: ferrimagnetism, electron spin controlled chemical reactions by radical pairs, and the magnetic forcing on small ions. Ferrimagnetic particles were related in several animals to magnetic field perception . They were also found in plants, e.g. a Festuca species , but their size and concentration appear too low for generating a sufficient magnetic force. The radical pair effect  requires a transient formation and recombination of radical pairs. Recombination can result in either singlet or triplet states, with the relative ratios, and thereby also that of subsequent products, being affected by weak magnetic fields. The mechanism has been studied in detail in vitro, e.g. in photosynthetic systems, but recently cryptochrome-dependent responses were investigated in vivo, e.g. in Arabidopsis [7, 8]. where mass m i as well charge Q i corresponded to one of the small ions in the electrolytes of the test object. This mechanism could be verified in several animal, plant and microorganism species [12–14]. It was clearly demonstrated that a definite effect can be produced by tuning to the ICR fundamental frequencies for physiologically important cations like Ca2+, Mg2+ or Na+. Changes in plant development and morphology were observed after breeding in MF+EMF parameterized to the Ca2+-ICR condition. Radish (R. sativus) showed slowed germination, but stimulated growth after exposure to Ca2+-ICR conditions . Under similar conditions, germinating beans showed increased radicle lengths, which additionally depended on the external Ca2+ concentration . Barley plants had deficiencies in growth, water uptake and photosynthetic pigment synthesis that pertained for several weeks after a treatment during the first 5 days of germination with field frequency combinations matching a Ca2+-ICR condition . Ca2+ regulates diverse cellular processes in plants as a ubiquitous internal second messenger, conveying signals received at the cell surface to the inside of the cell through spatial and temporal concentration changes that are decoded by an array of Ca2+ sensors [17–20]. Elevated concentrations of cytosolic free calcium ([Ca2+]cyt) are induced in response to various stimuli, such as red light, mechanic stimulation, cold shock, gravity, pathogen attack, and phytohormones [19, 21, 22](see also references therein), further by drought and soil salinity . During these processes, [Ca2+]cyt levels rise via gated Ca2+ channels that are located on the plasma membrane and intracellular membranes. The next stage in transmitting the Ca2+ signal within the cell is related to the signal "decay"; it represents the active removal of excess Ca2+ from the cytosol to the extracellular medium or organelles by means of Ca2+-ATPases and/or Ca2+/H+ antiporters. The primary intracellular targets of Ca2+ are various Ca2+-binding proteins; they ensure Ca2+ transport, serve as a Ca2+ buffer, or translate the Ca2+ signal to intracellular signal chains and initiate Ca2+-dependent physiological processes. In our previous long term study , we provided indirect evidence for the impact of MF+EMF parameterized to the Ca2+-ICR condition, on processes of plant development largely regulated by this ion. We now show that in a bioluminescent aequorin-mutant of Arabidopsis thaliana  changes in free Ca2+ could be directly monitored when field combinations were applied that match ICR conditions for Ca2+, and that these effects fall off when the conditions were detuned, or the intensity of the electromagnetic field was reduced. The aequorin producing mutant Col0-1 Aeq Cy+ of Arabidopsis thaliana (AEQ) was a kind gift of P. Galland (University of Marburg). It is a stem of biotype background Columbia and the cytosolic apoaequorin expression is controlled by the cauliflower mosaic virus promoter 35S . The Arabidopsis thaliana wild type used for control experiments was taken from an in-house stock (Ecotype Col-0). Both types of seeds were cultivated according to Plieth and Trewavas , with the following exceptions: Seeds were disinfected first with 70% ethanol (2 min) and then with a 5% aqueous solution of "DanKlorix" cleaner (Colgate-Palmolive, Hamburg) (15 min), and washed thoroughly 5 times with distilled water. Sterile agar plates containing 1.2% agarose (Merck, 1.07881) without additional sucrose were performed and stocked up in a refrigerator at +4°C, and warmed up to room temperature directly before use. Seeds were placed manually using an inoculation loop on the agar plates on a laminar flow hood, stored at 4°C for 48 h for vernalization, then incubated for 24 h under white fluorescent light (4600 lux), and finally kept in the dark for 4 days, at 21 ± 0.2°C. Thereafter the plants were grown at the same place with a 12 h light (4600 lux)/12 h dark period. After 10–12 days germinated plants had a more or less uniform shoot size of 5–7 mm and grew with an average distance of 1–1.5 cm on the agar, which facilitated later measuring on single plants by using a mask of black cardboard above the petri dish for selecting individuals. On the day before measurement the cytosolic aequorin was reconstituted. An aliquot (42.5 μL) of a stock solution of coelenterazine (1 mg, 07372-1MG-F, Sigma-Aldrich Germany) in ethanol (1 ml) was diluted with doubly distilled water (10 ml). The agar plates of the AEQ as well as the wild type plants were completely covered with this solution about 1 mm and incubated for 6 h in the dark. That warranted, that coelenterazine was available sufficiently, independent from the respective number of plants. Afterwards the supernatant liquid was removed, and the plates stored overnight in a dark box in the measuring room in order to minimize temperature- and mechanical stress of transportation before the measurements. All procedures with the Petri dishes opened were performed on the laminar flow hood. Subsequently there was no need for opening the Petri dishes for the optical measurements itself. The bioluminescence of aequorin was measured in a modular spectrofluorimeter (Spex Fluorolog 1), a similar instrumentation was described by Carson and Prato . The samples were placed in a permalloy shielding box (metal sheets 1 mm thick) that contained two pairs of Helmholtz-coils (inner diameter 13 cm), wired one on to the other, with 200 and 100 turns for the DC and AC magnetic field generation, respectively (Fig. 1). The first coil pair was connected to an adjustable DC power supply with an accuracy of 0.2% and a noise factor of <0.1% referring to the coil current. The second coil pair was driven by a function generator producing a 50 Hz sinusoidal signal, which was phase-locked with the power frequency. Thus almost any residual noise from surrounding electric facilities (50 Hz and its overtones) could be eliminated by a degeneration circuit, and interference was avoided. This technique was successfully used earlier by Pazur et al. and allows a controlled application of this important civilizing EMF frequency. Experimental setup (schematic) for monitoring cytosolic Ca 2+ by aequorin bioluminescence in a combination of magnetic (MF) and electromagnetic (EMF) fields. 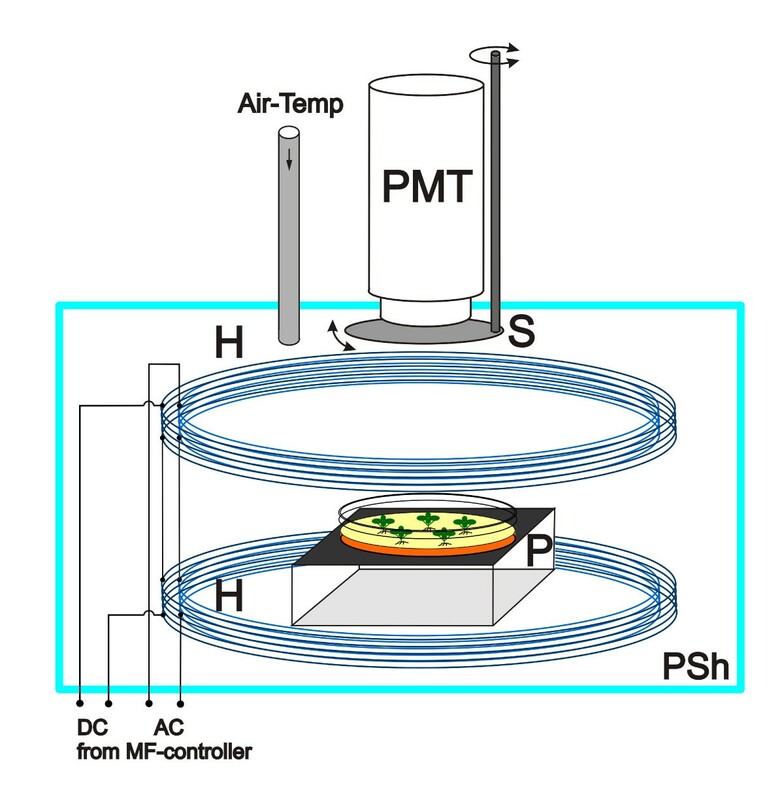 The Petri dish containing the sample seedlings (P) is positioned axially in the center of two pairs of Helmholtz coils wired one upon the other (H) and connected to control units, which generate the static and modulated magnetic fields. Coils and sample are magnetically shielded by a permalloy housing (PSh), that reduces any external MF and EMF to some percent in comparison to the fieldstrength applied inside, reversely even least magnetic retroactions to the components outside can be avoided. Aequorin bioluminescence was detected by a vertically mounted photomultiplier tube, which can be closed manually by a shutter (S). The temperature was adjusted by directing a gentle flow of temperature stabilized air into the sample compartment. At this frequency, ICR conditions for Ca2+ are matched at BDC = 65.8 μT (eq. 1). The sample dish was placed in the center of the vertical axis of the coil pairs, where a homogeneity error of the field <3% could be reached across the area of optical detection of about 20 cm2. The MF field strength and EMF amplitude were monitored by a fluxgate teslameter FM GEO-X (Projekt Elektronik GmbH, Berlin) directly underneath the sample. Intensity and timing of MF and EMF were controlled by a personal computer with a 12-bit DA-converter board. For reaching a constant temperature of 21 ± 0.5°C, a slight temperature stabilized airflow (20–22°C, dependent from the room temperature) of about 0.5 l/min was guided into the chamber, and the temperature monitored by a digital thermometer. The temperature equilibrated Petri dishes were inserted in the measurement chamber. The lid was closed and, as a precaution, additionally covered by a black cloth. 30 min after switching on the high voltage of the photomultiplier tube, the system seemed to have reached a stable operating point, and the initially increased AEQ luminescence, possibly caused by the prior handling of the plants, had decreased to a constant level. The bioluminescence was detected by a front-end photomultiplier Type R374E (Hamamatsu) operated at a cathode voltage of -1000 V, which had a high quantum efficiency at 400–500 nm wavelength. It was mounted axially in a shielding tube with a face to face distance of 7.5 cm to the sample dish and an aperture angle of 30°. A rotating sheet of black plastic served as a shutter (Fig. 1). The signal of the photomultiplier was digitized by a 12-bit AD-Converter, and fed into a personal computer using a home-made software. Shown data are averages of at least 5, these for BDC = 65.8 μT, BAC = 5 μT of 13 individual experiments with separate plant cultures. The course of the luminescence intensity could be monitored for extended periods (>2 h) of time with a resolution of 6 s. Data from 5–13 independent experiments for each of 9 categories were normalized and analyzed using Microsoft® Excel. Additionally the photon flux could be calculated using the manufacturer data sheet for the photomultiplier, a Gauss distributed spectral band with a maximum around 465 nm with a peak width at half-height of 80 nm was assumed therefore . The emission spectrum of bioluminescence itself could not be analyzed experimentally in default of a suitable monochromator. The germination rate of the AEQ seeds after 10 days was significantly lower (38 ± 7%) than that of the wild type (92 ± 5%). The effectiveness of the AEQ gene expression in the mutants layed at 45 ± 7% in 5 tests with 85 plants in total. That came up to the expectation, because the AEQ plants were heterozygous. It was discernible by the enhanced steady state bioluminescence from single plants, which could be optically selected by a relocatable cardboard. For 10 days old AEQ seedlings it was about 3–5 times above the dark signal and corresponded to about 2.6·104 photons/cm2·s by the assumptions described above, inspecting simultaneously 10–12 plants in the most cases. The usable full scale range of the detection system would amount to 5.3·108 photons/cm2·s by this scale. The absolute level of bioluminescence depended from the respective number of seeds per plate, size, and the coelenterazine uptake of the plants. Wild type plants showed no signal above the dark level after incubation with coelenterazine. Because the photomultiplier unit was outside the permalloy shielding box with the coils, an influence of the relatively weak MF on the photomultiplier could be excluded, but was nevertheless checked for safeness, as well in the total dark as with a piece of a phosphorescing clock face as a low light source. There was still no effect at 5 mT, the available maximum intensity of the apparatus, which was the about hundredfold of that used for the experiments. A static MF for the desired condition was applied continuously to the seedlings during the whole experiment. According to eq. (1) it was related to an additional 50 Hz EMF, running without any interference to the power frequency like described above. Before enabling the ICR condition by applying the EMF, the photocurrent was monitored for 30 min to ensure a stable background. After switching on the EMF, the bioluminescence of the AEQ plants increased significantly. After an initial lag-phase of 20–30 s, it rose within 7–8 min to a maximum that was about 3-fold higher than the basic level before EMF application. Subsequently, the signal intensity decreased again, and relaxed to nearly the original value after about 30 min (Fig. 2). This indicates a transient increase of the free cellular Ca2+ concentration that is induced by the EMF. In 8 independent experiments with different cultures, the maximum of the EMF-induced transient was 3.1 ± 0.26 times above the basal level. 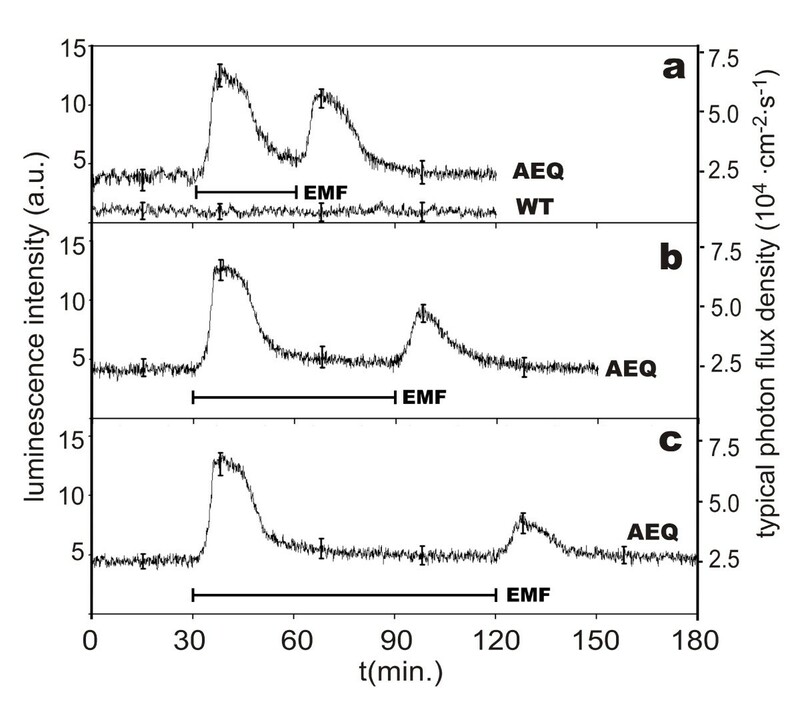 A second transient increase in [Ca2+]-stimulus was obtained when the EMF was switched off. It had similar kinetics, but only 2/3 the intensity of the "on-peak". 30 min after the "off" stimulus the aequorin-luminescence has been largely relaxed, but complete return to the basal level needed at least 60 min (Fig. 2b, c). Both the transients after turning the EMF on and off were well reproducible, the experiments shown in Fig. 2 were averages of 13 and 10 experiments, respectively. With increasing duration, the "off" response became weaker. This could be related to the interval between the two, or more precisely to the time the EMF was applied. One possible reason for the fading effect could be due to the progressive consumption of available coelenterazine, but the hourly long term loss of bioluminescence capability lay at only 3.4%, which corresponded to a half-life period of about 22 h. Hence a spatial, redistribution of cytoplasmatic Ca2+, finally more inconvenient for the ICR effect, could also be responsible. No transients were seen in any of the control experiments with wild-type seedlings under identical conditions. Bioluminescence response of the Arabidopsis aequorin mutant ( Col0-1 Aeq Cy+ ) to a combined MF (B DC = 65 μT) and EMF ( f = 50 Hz, B AC = 5 μT), matching Ca 2+ -ICR conditions (a-c). The horizontal bars below the graphs indicate the time of Ca2+ – ICR condition. All data are normalized against the dark current signal, which also corresponds to control experiments with wild-type plants (labelled as WT). The vertical bars on the curves mark the standard deviation at the indicated positions. The described experiments were performed such that the MF field strength and EMF frequency matched ICR conditions for Ca++. In order to prove that we observe indeed a resonance effect, the ICR conditions were detuned in the following experiments by changing the MF, and the ensuing Ca++ concentrations were again monitored by the aequorin bioluminescence. First, the EMF field strength was varied in order to find an optimum strength for the subsequent experiments with variable MF. The left bars in Fig. 3 present the 30 min. integral of luminescence above the background after switching on an EMF at four different field strengths. An EMF of BAC < 0.1 μT showed no effect, as also did the wild type plants used as control at any condition tested. A clear transient Ca2+-increase was already observed for an EMF with BAC = 1 μT, and saturation was reached at 5 μT; the data are normalized to this level. Setting the EMF to BAC = 5 μT, the strength of the static MF was detuned from the ICR condition (eq. 1). Both with a BDC lying 10 μT below (55.8 μT) or above (75.8 μT) the Ca2+-ICR condition at 65.8 μT, there was a significant decrease of the transient signal (Fig. 2). The right 4 bars (Fig. 3) show the 30 min. integral of luminescence above the background after switching on the EMF; the response is significantly decreased with both lowered and increased BDC. We also tested the effect of the residual MF of about 2 μT in the shielding box: there was no measurable change in the luminescence of the AEQ plants after switching on the EMF, indicating that there is no influence to cytosolic Ca2+-concentrations at the 50 Hz EMF solely without a MF according for both to an ICR condition (eq. 1). Response of bioluminescence in Arabidopsis aequorin mutant ( Col0-1 Aeq Cy+ ) and wild type plants to different combinations of static and modulated (50 Hz) MF/EMF. These were achieved by varying the fieldstrength around the optimized ICR condition for Ca2+ (BDC = 65 μT, BAC = 5 μT, f = 50 Hz). The 30 min. integral values are normalized to the corresponding 30 min. integral of the optimized condition. Experimental conditions: EMF of BAC < 0.1 (background noise), 1, 5, and 20 μT were used with a MF of 65 μT (left 4 bars), and MF of BDC <2 (background), 55, 65, and 75 μT were combined with an EMF amplitude of 5 μT (right 4 bars). The data for the Arabidopsis wild type plants at the optimized condition are labelled as WT. Standard deviations are shown by the vertical bars. The aequorin producing Arabidopsis mutant Col0-1 Aeq Cy+ facilitates a powerful way to study the cytosolic Ca2+ flux in response to exogenic stressors. The lowered germination rates compared to the wild type of this plant seen here also were observed earlier for the overexpression of cytoplasmatic proteins of the Hsp90 family in Arabidopsis , but a generalization of this prior finding in our case for Aequorin would remain speculative, also it could be a property of the batch just used. The subsequent calculation of photon fluxes by the data from an integrating detection system is too vague for a conclusion about the absolute Ca2+ concentration changes in the specimen. There would be need for a single photon counter, which was not available. Independent from all these limitations, the results found here suggest for the first time a direct and rapid influence of the resonant electromagnetic excitation of the cyclotronic frequency of Ca2+ on the concentration of this ion in the cytosol. This change is transient and relaxes within ~60 min, and Ca2+ transients were observed both by switching the Ca2+-ICR condition on and off. Plants usually maintain a cytoplasmatic free Ca2+-ion concentration of 100–200 nM by ion specific membrane channels and storage proteins or organells like the vacuole; higher Ca2+-levels are cytotoxic in the long-term [28, 29]. Several external stimuli can trigger a transient increase in intracellular Ca2+, which in turn triggers a variety of signal chains. The recovery kinetics depend on many factors and the type of stimulus, they vary from seconds to hours. The signal decay within about 30 min seen in the experiments suggests a rather slow regulation process, it is comparable e.g. to that seen for gravitational stimulation . In this study aequorin bioluminescence of the AEQ mutant was used to monitor changes of Ca2+ concentration; it avoids possible interfering stimuli e.g. by light, when fluorescence methods are used [28, 30]. Even though the latter methods e.g. by using chlorpromazine, "Fura" or "Fluo-3" give a substantively better signal , we considered the AEQ-mutants favourable due to the lack of potential interference and to maintain high selectivity for the magnetic stimuli. Earlier investigations of MF and EMF effects on Arabidopsis use significant higher magnetic flux densities up to 400 mT  and more, but the MF and EMF intensities used in the recent work are weaker by some orders and furthermore the effect depends on the specific charge (Q i /m i ) of ions. Thereby three questions arise, firstly, if an influence of such weak MF and EMF fields on Calcium signaling in living cells would exist in general, which is probably seen by the findings in this field up to now. Further other important ions should also be affected, which also was shown in some cases [33–35]. Not at least the knowledge about the underlying physical mechanism would be essential. should not be possible in an aqueous phase. This paradox has been addressed earlier by the suggestion, that ion channels and ion-protein complexes guide the ion orbits [11, 36, 37] and can maintain the necessary coherence length λ = 2·r L of some 10-9 m free from thermic environmental influence. But the ICR effect could be observed even in aqueous solutions of small molecules like glutamic acid [34, 35, 38] without any additional biological components, and the need arose for a more universal explanation for the ICR effect [39, 40]. The existence of dielectric boundaries is common to any biological or in vitro system probed for MF and EMF effects. Important properties of a resonance effect like ICR are reflected in the line width and amplitude of resonant excitation. Both parameters seem to be wide in our experiments (Fig. 3). This is not uncommon for in vivo conditions (see Binhi  for leading references). The relation of MF fieldstrength and EMF amplitude BAC/BDC was selected in many studies in a range 0.3–2 [13, 15, 41], meaning a BAC up to 100 μT. The finding of an effective BAC < 100 nT and vanishing of the ICR effect for EMF amplitudes exceeding some multiples of that value by some laboratories  nonetheless could indicate a relatively narrow and sharply defined plane, in which Larmor orbits lie. Moreover such weak EMF are nearly ubiquitous, caused by natural and man-made phenomena in the atmosphere, enabling many different ICR conditions in combination with the geomagnetic field, by which influences to our health and ecology could arise, above all, if Ca2+ resonance is affected. In summary the work presented here shows in Arabidopsis thaliana seedlings transient Ca2+-responses to MF/EMF combinations matching ICR conditions for this ion. The effects reported here are averaged for the entire plant; they do neither provide resolution over the different organs nor within individual cells. Future work using e.g. Ca2+-responsive fluorescent dyes and confocal microscopy will be needed to show if local effects may be even more pronounced. Arabidopsis thaliana mutant Col0-1 Aeq Cy+. -Professor H. Scheer (Munich, Germany) for his interest and for frequent discussions over many years. The scientific equipment used for this work was partially provided by the collaborative research centre SFB 533 (DFG). -Professor P. Galland (Marburg, Germany) and his workgroup for abandonment of the Arabidopsis aequorin mutant and instructions for cultivation. The authors carried out the experiments, compiled the background information and drafted the manuscript. All authors read and approved the final manuscript.